A couple months ago, I wrote an article about the 2015 World Latin Dance Cup, which this year was one of the most poorly organized events I’ve ever attended. The article really resonated with people, and was shared hundreds of times across social media and read by over 11,000 people around the world. One of the questions that I received from a number of people after I wrote that article, was how the World Latin Dance Cup compares to the World Salsa Summit, a similar Latin dance competition held in February every year. At the time, I had never been to the Summit before, but this past week I had the chance to attend the World Salsa Summit for the first time, and I’ve decided to share my experiences here so that others who are interested in seeing what the event was like. Attending a Latin dance competition is a huge investment of time and money (expenses run in the thousands when you include airfare, hotel, registration fees, costumes, and other costs), but it is hard to find reviews of what the events are like online. Hopefully this article will give you a better sense of what the World Salsa Summit is like, and how it compares to the World Latin Dance Cup. The World Salsa Summit is the most organized salsa dancing competition I’ve ever attended. The event runs on time, judges use electronic scoring, and schedules, scores, & videos are posted online in a timely fashion. The shorter duration and lower price makes the competition more affordable, and divisions such as heats encourage competitors to compete in more divisions. The competition also offers prize money for pros. On the cons side, the competition is less well attended than the WLDC, although attendance is growing every year and the top competitors from the WLDC also attended the Summit. There are more competitors from New York and fewer dancers from LA. The production values were also not quite as high as the WLDC. The World Salsa Summit is a salsa & Latin dance competition held in Miami every February (it is actually held at the Deauville Beach Resort, the same venue as the WLDC). The competition was started in 2013 by Billy Fajardo, the former head judge for the World Latin Dance Cup, along with Katie Marlow and Nelson Flores. Billy is a longtime judge and competitive dancer in the salsa & Ballroom world, and along with being the former head judge of the World Latin Dance Cup, he was also the head judge of the US Salsa Open Championships and organizes a similar event for the Latin Hustle community. The World Salsa Summit is smaller in size relative to the Latin Dance Cup, but attendance has been growing steadily every year. The competition runs for four days from Thursday to Sunday, and features nearly 70 categories for competitors, in genres including salsa, bachata, cha cha cha, merengue, samba, and Latin hustle. The competition features divisions for dancers of different levels, including Novice, Amateur, Rising Star (semi-pro), Professional, and Pro-Am. The World Salsa Summit also features workshops during the day, a VIP dinner on Saturday, special dance showcases and dancing every night until 2am. Presentation is one area in which the World Latin Dance Cup really shined, while the World Salsa Summit was somewhat lacking. The World Latin Dance Cup this year featured an amazing stage design by the talented Magali, with a gorgeous backdrop and paintings that really added to the atmosphere. The Latin Dance Cup also features high quality graphics for their videos, which really adds to the production value, and professional photography by the talented Ricardo Tellez. There are also a number of little touches such as interviews with competitors after they compete that makes competitors feel like stars at a sporting event. Say what you will about Albert Torres, but he knows how to put on a good show. The stage design for the World Salsa Summit was spartan in comparison, featuring a Ballroom dance floor with a few simple decorations as backdrops. This may be a matter of taste, but the production values for the Latin Dance Cup felt higher. The advantage of the Ballroom floor used by the Summit was that it was a higher quality floor than the stage used for the Dance Cup, but the downside of having a dance floor rather than an elevated stage is that it made it more difficult for spectators to see the action. The pricing for the World Salsa Summit is much more affordable for competitors than the World Latin Dance Cup. The World Latin Dance Cup had a lower competitor registration fee of $90, but individual divisions were more expensive, ranging from $100 for a solo to $175 for teams. The Salsa Summit, in contrast, had a higher competitor registration fee of $165, but lower costs for individual divisions, ranging from $35 for a heat to $100 for team competitions. This means that if you were to attend the World Latin Dance Cup and only compete in one division, the cost may be lower than what you would pay for at the Summit, but if you compete in multiple categories, the Salsa Summit is a better deal. As an avid competitor myself, my preference is for the Summit pricing because it makes competing in more divisions more affordable, and I saw many competitors taking advantage of the pricing at the Summit to compete in many divisions. The one thing I didn’t like about the pricing at the Summit was the high cost for spectators. Tickets at the door for a full pass were $185 just to watch, which seems high to me. The organizers of the Summit need to lower ticket prices to encourage more friends, supporters, and fans to check out the show. One area where the Summit really outperforms the Latin Dance Cup is in the cost of the hotel. The World Salsa Summit is more affordable by virtue of being the shorter of the two competitions– the World Salsa Summit is only 4 days long, compared to a full week for the World Latin Dance Cup. The World Latin Dance Cup has grown in length every year, and has gotten to the point of being too long for a dance competition. The first two days of the competition are for “Qualifiers” which are mostly for show anyway, since most divisions don’t have more than a handful of competitors, so you automatically qualify for the semis. However, as an amateur competitor, you still have to arrive on Monday anyway if you want to “qualify” for a division. The Finals for the WLDC are also not held until Saturday, so you have to stay for the whole week if you make it to the Finals. Taking off a whole week from work and ponying up a week’s worth of hotel fees is no small cost for amateur competitors, who only get 2-4 minutes on stage time. At the Summit, many of the Finals are held on the same day, so competitors don’t have to spend a full week just waiting to compete. It is ironic that the World Latin Dance Cup, which once helped grow the amateur salsa community by creating a competition with amateur divisions, is slowly becoming too expensive for many amateurs to afford. The aspect of competition that the World Salsa Summit really shines in is organization. The World Salsa Summit is the most well organized salsa competition I have attended— pretty much the opposite of the World Latin Dance Cup. Registration for the World Salsa Summit was a relatively smooth process, not the 3-hour nightmare that was registration for the WLDC last year. The competition stuck to the schedule for the most part, unlike the Latin Dance Cup which was always late. What was really nice for competitors is that they provided you with the exact time that your division would be competing. For example, if the competition began at 2pm, but your division was the 5th division of the day, they would tell you exactly what time your division starts based on the number of competitors competing before you. That way you don’t have to show up at 2pm and wait around until your division is up, you can just come down a few minutes before your division is about to compete. Schedules for all the divisions were available online and updated in real-time so you could go online to see exactly which competition was currently going on, an excellent use of technology which came in handy for both competitors and spectators. Judging was a quick and efficient process thanks to the electronic scoring via iPads that the judges utilized, and there were no addition errors for scores like there were at the WLDC. 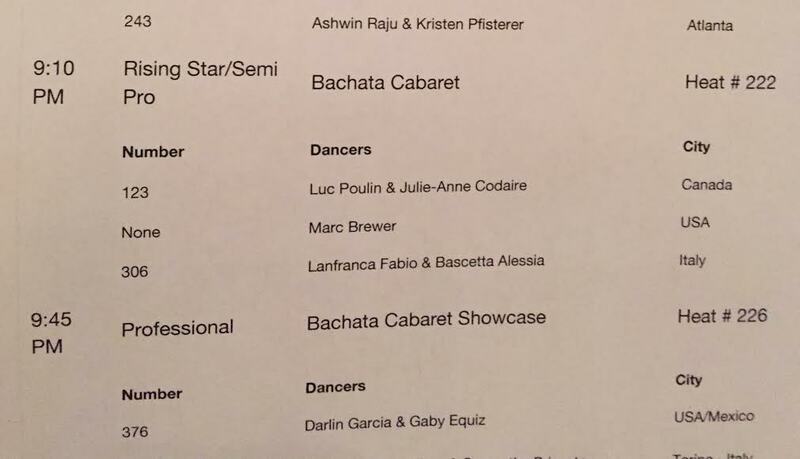 Scores for the competition were also posted online automatically, within hours or even minutes of the competition, so you could see exactly how everyone scored online instead of having to go down to the lobby and read off pieces of paper like at the Latin Dance Cup. Another nice touch is that videos of the competition were posted to the World Salsa Summit YouTube channel within hours of the competition, so you could see how you and your competitors performed. The World Latin Dance Cup takes months to post videos, and many aren’t posted at all, but at the Summit they were available almost immediately. The Summit also allows spectators to take photos and videos during the competition, which is strictly forbidden at the Latin Dance Cup. Overall, the World Salsa Summit ran smoothly, and was a much better experience than the Latin Dance Cup for both spectators and competitors, making good use of technology to keep everyone updated on what was going on with the competition. 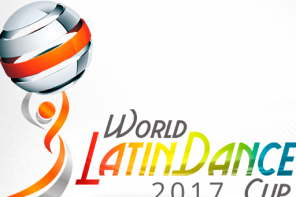 The World Salsa Summit had close to 70 competitive divisions this year, compared to the 80 divisions at the World Latin Dance Cup. There is a lot of overlap between the divisions at the Summit and the Latin Cup, but there are a few key difference. One of the main differences that I noticed at the Summit is that in addition to Amateur and Professional divisions, they also had divisions for Rising Stars (semi-pro) and Novices (beginners). This is a welcome distinction, so that newer dancers don’t have to compete against amateurs who have been competing for years, and likewise the Rising Stars division allows competitors to more smoothly bridge the gap between Amateur and Professional. Another category of competition that the Summit has that the Latin Cup doesn’t is heats. Heats are social dancing competitions, where a random song is played and the competitors have to improvise a dance rather than perform a rehearsed choreography. 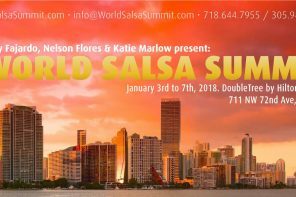 The heats were an extremely popular category at the World Salsa Summit, especially the pro-am heats where Amateurs got the chance to dance with Professionals. Since no choreography is involved, you can ask any Pro to dance with you, even one you’ve just met at the competition. It’s a great way for Amateurs to get the chance to compete with their favorite Pros, and for Pros to earn some extra income. Another division that the Summit has that the Latin Dance Cup lacks is Amateur Cabaret. For some reason, the organizers of the Latin Cup stubbornly refuse to allow tricks in any Amateur divisions, allegedly for safety concerns (despite tricks being allowed in the youth and junior divisions). At the Summit, however, there are multiple divisions in which Amateurs can perform tricks and lifts, which I am personally a fan of. Overall, I felt the heats and the different level of competition that the Summit provides add another dimension to the competition, whereas the Latin Dance Cup has a lot of divisions for the sake of having lots of divisions (“Pro Am Latin Over 75 Lady Lead”), many of which didn’t even have any competitors. In terms of competition, the World Latin Dance Cup definitely had more competitors than the World Salsa Summit, but the level of competition was still very high at the Summit and the top competitors in the sport showed up to both competitions. The reigning champions from the Big 3 divisions (on1, on2, & cabaret) from the World Latin Dance Cup all competed at the Summit as well, with Deklan & Natalia winning the On1 division, Simone & Serena winning On2, and Ricardo & Karen winning the cabaret division. The small teams division was won by Baila Conmigo (who placed 2nd & 3rd at WLDC) and the large teams division was a tight race between Alma Latina (former WLDC champs) and The New York Movement. One of the main difference that I noticed between the two competitions is that the World Salsa Summit had more competitors from New York and the East Coast, while the World Latin Dance Cup had more dancers from LA, which is perhaps not surprising given where the organizers of each event are based. There were also a large number of competitors from Puerto Rico and other South American countries who weren’t present at the Latin Dance Cup. There were a large number of Canadians at both competitions, but not the same set of Canadians, and there were no dancers from Turkey or Japan at the World Salsa Summit. So the participants of both competitions were largely a reflection of the networks and alliances of the organizers, with some overlap, but neither competition had a monopoly on all the good competitors. The Summit had The New York Movement but not Omambo, the Couture Dance Alliance but not Salsamania, Alma Latina but not Balcon de los Artistas. I will give the edge here to the World Latin Dance Cup, since they had more attendees overall, but it will be interesting to see how attendance for both of these competitions grow in the future. Both the World Salsa Summit and World Latin Dance Cup are streamed live around the world, and the Summit is definitely the smaller competition of the two when it comes to viewership numbers. However, the difference between the two is not as big as you might think, if you’ve seen some of the bogus numbers thrown out by the Latin Dance Cup. The World Salsa Summit received 40,000 total views for all of its videos over the course of the competition, with a peak concurrent viewership of around 1,200 viewers on Saturday night for the finals. All of the videos from the competition are also posted to their YouTube channel, and should continue to gather more views over the coming months. 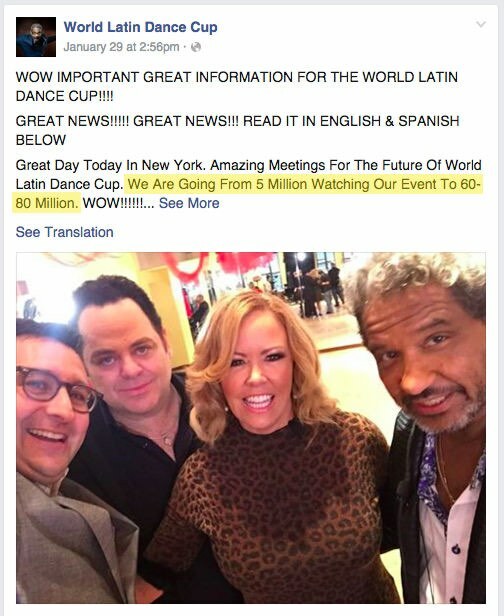 The World Latin Dance Cup on the other hand claims that it is “Seen Live By Millions”, which is pure bunk. The live YouTube view count for the Latin Dance Cup hovered around the thousands for the finals of competition, but were nowhere near the millions. On Facebook, the WLDC has one video of Ricardo & Karen (which they promoted via paid Facebook ads) which has a few hundred thousand views, but most of their other videos have a few thousand views at best. In fact, most of their videos are never posted at all. If you were an amateur competitor who competed on Monday or Tuesday morning at 9am, the only people who saw your performance are the people in the room and a few hundred people on YouTube, not millions. You could be seen by more people by performing at your local salsa congress. Ignoring the fact that the WLDC never had a million viewers to begin with, the most watched episodes of So You Think You Can Dance, America’s Got Talent, and Dancing With The Stars last year received 4 million views, 11 million views, and 13 million views respectively. That’s 28 million views COMBINED. Albert is claiming that the World Latin Dance Cup will be seen by 2-3 times that number of people, which is pure fantasy as far as I’m concerned. One final thing I should mention is that the World Salsa Summit offers prize money for the winners of the professional divisions, while the World Latin Dance Cup does not. Albert Torres is notorious in the salsa community for offering prize money for his competitions, then not paying up. In fact, the WLDC stopped offering prize money to competitors at all since 2012. There are no such shenanigans at the World Salsa Summit, where the winners are handed their prize money along with their trophies. There was $15,000 in prize money up for grabs at the Summit this year, and the winners of the pro divisions were paid on the spot. It seems like a no-brainer to offer compensation to professional dancers. When even college salsa competitions such as the College Salsa Congress and Collegiate Salsa Open offer prize money to the winners, it seems backwards that a major competition like the World Latin Dance Cup does not. Overall, the World Salsa Summit was a much better organized event than the World Latin Dance Cup. The event ran on time, the judges used an electronic scoring system which was fast & accurate, and event schedules, scores, & videos were posted online in a timely fashion. The Latin Cup still boasts higher attendance numbers, but attendance to the Summit is growing annually and the top competitors from the WLDC also attended the Summit, making for a strong competition. For Amateur competitors, the World Salsa Summit is hands down a better experience. The event is shorter, and thus more affordable, and the lower entry costs mean you can compete in more divisions. The divisions are also spread out evenly through the week, so you can easily compete in a Pro-Am on Thursday, do a couples routine on Friday, compete with as a team on Saturday, and get a chance to dance with your favorite Pro on Sunday in a Pro-Am heat. There are also Amateur Cabaret divisions for Amateurs who enjoy tricks, and a Rising Stars category for Amateurs who want to move beyond Amateur but aren’t quite ready to go up against the most experienced Pros. Contrast that with the World Latin Dance Cup, where Amateur competitors have to arrive on Monday if you want to qualify or Tuesday if you are pre-qualified. Since only a few competitors will make it onto the Finals, for the majority of Amateur competitors your competition will end on Tuesday, but you have to stay until Saturday or Sunday because you’ve already booked the hotel & flights, paying over a thousand dollars to do so. Most of the Amateur competitions will have low viewership because the competition starts at 9am (6am West Coast time) on a Monday or Tuesday, and the videos from the competition will likely never be posted online. For Pros, it still makes sense to attend both competitions since you won’t have to stay as long as an Amateur would, and you get the opportunity to compete against the best dancers from both the West & East coasts. With the Summit you will have the opportunity to compete for prize money, and although the Latin Cup doesn’t offer any prize money, winning the competition can win the attention of Albert Torres, who remains one of the largest promoters in the international salsa world. 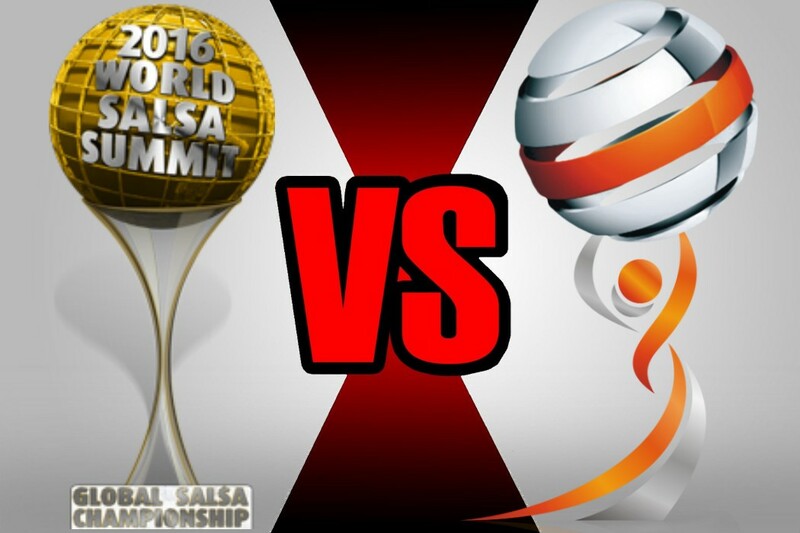 Those are my thoughts on the World Salsa Summit vs the World Latin Dance Cup. Personally, I will be skipping the WLDC this year and work towards the Salsa Summit in 2017, even though it is at an awkward time of year. There are also a couple of new competitions coming up this year as well, such as the Ultimate Latin Dance Championship and World Salsa Championships, which will be interesting to watch. If you’ve read this far and have attended either or both competitions, leave a comment and let me know what you thought of the World Salsa Summit and World Latin Dance Cup. I would love to hear what you think! I love how you always write a very unbiased opinion of the competitions. Thank you for writing this article. Many dancers are afraid to voice their opinion and afraid of threats and repercussions for doing so. Thank you, Thank you Takeshi!! Thanks, Takeshi, for the update. Sounds quite informative, and seems like great info for one to make a reasonable choice from the two events. if i may share a related finding in terms of attending events, which may be great for some folks and perhaps not so much for others, some folks i suspect already do events this way. Personally, i have generally decided to skip these sort of “stand alone” events, including congresses etc. What i mean is, i’ll still go to a congress or two, or more a year, if i can, but i would like to be able to do more than just the congress. For instance, i hope to be in New York this coming summer. However, i hope to be there earlier for a couple of weeks, do the local spots, take classes, attend socials, and eventually do the congress. it seems to me to be more valuable than a single weekend holed up in a hotel, doing just the workshops there, many of which folks often have to skip, after dancing late, and getting zero sense of a local scene, or being able to visit the city and do other things. I’ve done the usual thing at a few congresses, been holed up in hotels for the weekend, no doubt had fun etc. but last summer i spent two weeks in NYC, doing my own thing, hitting as many spots as i could, when i chose, taking as many classes as i could with the maestros in the evenings, and finally hit the congress, while staying at a local hostel or hotel other than the congress hotel etc. i found it to be a much more fruitful and exciting way of traveling for salsa in many ways. in terms of cost, i got much more “bang” for my buck, in spite of being in an expensive city like NYC!! a week there cost me just a little more that it costs me getting holed up for a weekend at, say, the congress in Chicago! i stayed in one of the best hostels in the world, right in Manhattan, steps from the subway, a 24 hour super market and bodega across the street, and a surprisingly affordable chinese food place, great social environment, safe, hostels events, from evening pub crawls, to guided tours of the city, Central Park, various districts of NYC etc, and the hostel even had its own monthly social, where a lot of the great dancers in NYC dance!!! i danced almost every single night, at most of the great spots, from Jimmy Anton’s to the Copa, or Taj, for two weeks, took the train back to my hostel like 2 am each night/morning, all for much less than i would holed up in a pricy hotel at a congress in a cheaper city than NYC!! !, and learned the most salsa i’ve learned in my life, years of taking classes, going to congresses etc. a congress may still be the better option for some folks who have only a weekend to spare, or those who can comfortably afford to spend pricey weekends in hotel. but for those who can’t, and would like to have an amazing, even lifetime, experience for a more reasonable cost, and a surprisingly longer period than a weekend, what I’ve found is that instead of “spreading” one’s resources thin by going to pricey congresses here and there, often holing up in just hotels, and increasingly having questionable experiences like over-booked events where one can’t even find space to see the performances, or using up one’s hard-earned holiday time etc etc, it works much better, if you’re like me, spare your holiday time, target fewer events, pool your resources, do a bit of travel research, and then absolutely hit an amazing scene like NYC and do nothing but dance your legs off for a couple of weeks!!! skill-wise, i found, i improved so so much more and “sustainably” or “permanently” than i’ve done from congresses. concentrated practice and experience, by being in a spot, especially a great sport, like an NYC, or Paris, or London, or Chicago, or Miami, with a great salsa scene, each night dancing along all the stars, from Sekou to Rasove, to Eddie Torres JR, etc etc, even the “non-stars” local dancers in NYC are absolutely great, in my finding, may be a much better way to travel for salsa, both for the wallet, and in terms of skill improvement! even when, say, the congress isn’t well organized, one isn’t too disappointed cause one has already experienced a lot of other great spots. this literally happened in NYC last year. the event wasn’t too well organized, but for folks who didn’t “put all their eggs in the single congress basket” it wasn’t too big a deal. some days, i and several people literally walked from an Eddie and Maria Torres class, and went and danced at the congress, or from a Jimmy Anton social!! when folks were complaining about being unable to see the performances, i and many folks who were doing things other than the congress were having a total blast!!! so, from now on, i am mostly going to places and events where i can do more than just the congress, unless an event doesn’t brake my wallet, or is super-awesome enough to attend in a “stand alone” manner. this may not work for some folks, but for those who can do it, and most people i know are like me, it may be a very rewarding alternative to the more common set-up. i think there’s even salsa companies now that are starting to sort of try to provide a somewhat similar sort of set up. an increasing number of salsa dancers probably already do their salsa traveling this way, and have been doing it this way for perhaps even longer than most average dancers like myself. but, for those who haven’t done this before, or are thinking about it, i can tell you its a great way to do it!! Thanks for the comment, Fred. That’s a very good point about improving your dancing by visiting a city vs attending a single expensive event. You can definitely get more bang for your buck that way. I think the one benefit of congresses it that it attracts dance instructors from around the world, so you have the chance to takes lessons & privates without having to fly to a bunch of different cities. And of course for competitions, there is unfortunately no substitute for attending events, which can get pricey. I see your point, Takeshi. I am happy for people who put in a lot into these things! About folks not paying up when they’ve promised to, that’s really troubling! Very unfortunate! One of the reasons a lot of these events are going to the drains! Last year, you may have gothered from FB and other sources the NYC congress was a bit of a disaster! Not sure why, but the late Choco did apologise, bless his heart!! I heard a lot of bitter folks and the classes were overcrowded etc etc. It seems like these things are happening increasingly at congresses! Organizers overbook for small spaces, so I guess they make more money for less cost? I don’t know. Luckily for me in NYC last year, I’d already been there over a week, hitting all sorts of spots taking classes all over the place. So I really didn’t notice the mess too much! Even Chicago last year was disastrous for the performances, couldn’t get a seat, over-booked, they had to have an “over-spill” hotel! I gather it’s heading that way this year too! Hi Takeshi, thank you for your article. I’m Alejandro Scotti from MamboSalsaNYC.com that was in charge of the LIVE streaming at WSS16. I’d like to clarify, and it’d be great if you could revise your article with this information, which I can provide you proof of. We had a total of just under 40,000 PLAYBACKS for the entire event. The highest PEAK CONCURRENT viewership was about 1,200 on Saturday night and about 650 on Thursday and Friday. Sunday was obviously the lowest concurrent viewership at about 100 with about 5,000 total playbacks for the day. It’s impossible to know exact UNIQUE viewers because the same person watching from a smart phone and from a home computer will count twice. Our entire YT channel has today a total of 200,000 plays. Please let me know if there is any other viewership data that would like to know. Ok, thanks for the clarification, Alejandro! Hi Takeshi: I posted my comments after your previous article since I competed in the WLDC in December. As mentioned, the coolest thing was competing/mixing with the best. I think Mr Torres tries to be inclusive & that’s a great thing in this world! It was disorganized and I have no idea where the video of our team disappeared to, but it was a great experience. Would I go again? Not unless I was going to have a chance to get in the top 3. I’ve already suggested our salsa team go to WSS or even Toronto to compete nationally or even Europe just to perform because we’ll never beat the Latino teams (24 teams at WLDC) & that’s depressing! So I’d pick a category with fewer entrants, myself. The first time, yes, it’s worth it to go for the experience, but I’m not working a year & paying thousands again unless I have a shot at top 3. Fred is absolutely spot on, ya gotta go for more than just the congress. In Miami, I had a brother & lots of friends to visit. Vegas & Hawaii congresses I went for hot weather, San Diego congress was combo with LA for my birthday, after SalsaMambofest I went all over Mexico, etc. All of my vacations involve checking out the local dancers & classes; it’s so easy with FB to do. Some congresses defeat themselves with timing (Seattle in November?? Chicago, Houston etc should be spring!) or a venue hotel too far from anything else (Tucson, Porto Santo). Anyway, I may not make it to WSS for 2017 due to surgery, but gearing up for 2018! This is great review but as a competitor for the last 11 – 12 years. I have competed in the following: The Club Mayan, World Salsa Championships, World Salsa Open, World Latin Dance Cup, Hong Kong World Salsa Championships and every competition has its pros and cons. I guess it depends on what you are after and where you are coming from that will make the difference. I led Team Australia of 20 competitors to WLDC 2015 and because we were well prepared and organized, the hiccups that they did have we didnt feel as we were well prepared for any situation. From having all emails, reciepts and ID’s at rego, to been ready backstage for any changes as do occur in every competition. Our preparation made the experience for all my amateurs and pros for many years in a row now, very very good. As for affordability, we travel from Australia .. and we only go if our finances are there, we dont go if we cant afford it. Like anything in life, you dont spend beyond your means and then expect the debt to go away. So expense is not events issue, its personal issue if you decide to overspend. Thats for any event really. COMPETITORS who compete for prize money i suggest DONT. Do a congress or a festival as thats where the money is, not competitions. Competitions who offer alot of prize money as incentives, then lack in other areas like presentation etc. Id much prefer to dance on proper stage with a an amazing set up and backdrop than a dance floor without adequate viewing space or lighting for people who are watching across the world on stream to see. As Dani Breton above mentioned the vast majority of dancers at WSS are US based and doesn’t full represent the world. For me travelling from Australia, i want to compete against every corner of the world and against the best, regardless of my result. There is no point of calling yourself world champion if the competiton is not inclusive of the whole world. My point here been as much as i think your review is spot on for your eyes, as a dancer/competitor and coach, Uruguayan born and living in Australia … The WLDC is more expensive yes … Its has its flaws yes .. but ultimately, its is and always has been the best competition in the world .. regardless of any politics or money issues … this is pure experience based for dancers travelling from the Australia. I speak for many who have travelled with me over the last 10 years. PS I dont normally comment on many things but you, you are thinker and raise good points. My reply is purely conversational as i like open discussions. Keep your post coming, and ill be reading from Australia! Hey Nestor, thanks for the comment– that’s a very impressive competitive background! I hope to be able to check out more international Latin dance competitions in the coming years. I agree on the issue of transparency, I had the exact same experience happen to me at the WLDC. Every competition should embrace transparency and post the individual scores from the judges and not just a composite score. Every judge is going to have their own biases & preferences, but at least that way competitors can figure out what they are. That’s the way it works in sports like gymnastics. Having actual feedback will allow competitors to improve, instead of being given a single, meaningless number. Best of luck to your team, and hope to see you guys at future competitions! Wow! That’s a long way to travel! I am sure it was a great experience! So happy for you! I spent some time in Australia a few years ago and loved the scene in Melbourne!! I always wonder about the fairness of the judging in those things! It seems risky to assume that it is objective! If I competed, I would do so for the experience and fun! I would entertain no hope whatsoever of winning!! I just checked out the on2 semis because of your comments. And you’re absolutely right. Your partner most DEFINITELY should have made it to the finals. And to think I was underwhelmed by some of the top placers, meanwhile better talent got cut. Sorry about your luck! Awesome article! Loved the differences between the 2 comptitions pointed out..The WLDC used to have money prizes but they never did pay their competitors and I think they finally just gave up the idea of a fake prize due to lack of funds!.. And the biased scoring doesn’t just apply at WSS..it also happens at WLDC…A few years back.the judging system were so.biased, it was so bad that Albert kicked both Katie..and Billy out..and thus why they started their own hence WSS..
.As a competitor, if I spent thousands.on dues, transportation, costumes, hotels.and poured out an entire year of blood and sweat and forgo sleep and dating/ family..you bet that prize money.comes in handy-! That trophy and prize money is the ultimate prove of all the sacrifices, blood and sweat we poured into our dance. if you are going to compete..the ultimate goal is that trophy and prize money! !..Sounds like if I have to pick one..I’ll be doing WSS.. So, Kat, my personal understanding, and I haven’t competed in these things or watched much of them at all, but do know a few people who took part this year, was that the main way they gain is through publicity for their companies. I find it quite risky to put so much in expecting to win or be among the top three. It just seems so risky to assume that, unless there’s corruption of some sort! Cause there’s other teams other people working hard, too! It seems unwise for one to kind of take it for granted that they’ll win. So, my assumption about these events has been that people mainly benefit through getting their names out there. Like, even when one gets 3rd or 4th or 5th, or just competes, they can put it on their dance company website, or like somebody said, organizers like Torres and others can see them for future congresses, or students back in their hometowns can see them etc. To put ones eggs all into the winning basket just doesn’t seem wise! The judging issues sound like pure cheating or corruption. I think any sensible competitor who doesn’t assume it’s biased is in dream-land! It likely is, at the very least cause of the way the system is set up! Like if they wanted these things to really be fair, there are ways out there to do it! As a student who does research, it seems to me that the only thing that explains the presence of the judging system is to ensure that some “selected” folks win! For example, if they really wanted an open and fair scoring system, they’d introduce several checks and balances, like have a portion of the score be done by the audience say by some kind of electronic voting etc. This may not be literally what they do, my point is there are ways to come up with a system that tries to be as open and fair as possible, certainly fairer than leaving it to a few judges alone who’s methods are mysterious or who may be biased or know or have interest in some competitors. My assumption is that everybody who competes in these events and really expects a “fair” and open system in the current setup is deceiving themselves! Of course it’s not!! What are the rules or what’s the scoring system, who’s judging, who owns the event etc etc. If these events are owned by these individuals, and the same “judges” show up each year, and they’re from the salsa community with ties to dance studios with so many interests etc etc, it just seems like there’re so many undeclared interests and connections and all sorts of loose ends, like, personally, the more I think about the whole setup, the people who organize these things etc, like are they money making ventures or private ventures etc etc, the more any expectations of fairness unfortunately just seem so laughable! Anybody who goes into these sort of events the way they’re setup implicitly accepts the fraud that comes with them!! It’s just seems like an obviously biased game, and by taking part, people unfortunately validate it!! I can’t believe it’s something global!?! outrageous! There was no prize money offered? I was there, we won Bachata teams and no money was ever offered? Only in some divisions, I believe. there were prize money promised, in the end of the competition each winner was supposed to get about 200$-500$ prize. no one got anything, and probably won’t. Takeshi, much appreciated for the review. I’m curious what the difference is between the two events regarding the music selections available. Any insight? Good question. The WLDC used to be restricted to a set song list, but as of last year there are no song restrictions for either competition. Very nice article. 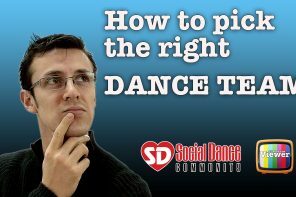 I haven’t attended either but is always good to read about the main differences between salsa events. Keep them coming. Takeshi, I suggest that you get in touch with Billy Fajardo and do an interview to cover many aspects of the WSS scoring system and choice of dance floor. Many comments here are simply wrong; the WSS scoring system simply doesn’t allow for favoritism, even if a judge were to give a biased score (lowest or highest between judges) it’d get dropped out automatically. The lowest and highest scores get automatically thrown out. During Saturday night finals there are 15 judges so even if a judge was still somewhat biased, it still gets averaged out between the other 14 judges. Most dancers that take private training with many of the judges more often than not will place higher in the ladder simply because these judges are the best trainers in the world; not because the judges give out biased scores. thanks, Alejandro, for your input. if i may respond to your comment, many of dancers i’ve seen who are champions from these events, i think, are indeed great and able dancers, with amazing techniques, and even better individuals personally. i’ve taken classes with some of them, and they absolutely work so hard and do things and put in a lot of sacrifice that most average folks like myself don’t, and i absolutely love their dedication to the art. however, whether or not i like these dancers personally, it still presents a conflict of interest when the judges at these events are also often the coaches of several of these competitors, because competitors have an incentive to train with the judges, and the judges have an incentive to have the champs training with them. i don’t know and can’t speak to whether there’s bias or not happening, but clearly the conditions for conflicts of interests to take place are present. what can be done about it? perhaps, have judges that are not attached to any competitors to minimize the potential for conflicts of interest. FYI: i really have no dog in this race. i have no dance studio, and i am a pure “armature” or average dancer with nothing to lose whoever wins or loses in any of this stuff. i’ve not even watched most of these things online!! but, i do research at a school, and love salsa and like many folks know people who’ve taken part in these things. so, i comment purely as an academic who does research and loves salsa. at the end of the day, it is at least nice that we have a salsa scene to debate!! so, personally, i am thankful for these artists and the pros who bring us the fun even while decrying some of the stuff i would rather not have. Fred, I don’t think there are many world class professional dancers who can judge a competition of this caliber, who don’t also teach dancers for a living. That’s the definition of a professional: Someone who earns a living from teaching how to dance. I think the best you can do is have a diverse panel of judges from different countries and schools of dance, so there is a diversity of perspectives that won’t be swung by a single biased judged. Thanks for the feedback, Alejandro. I thought the scoring system was fair and much better than the WLDC since the WSS used an electronic scoring system. I still think every person has biases, though, and it would be nice to see individual judges scores instead of just an aggregate number which doesn’t tell us much. Like in gymnastics, it should be clear who is giving what score. Another example of fairness at the WSS: Billy Fajardo and Tito Ortos train some of the professional dancers however, neither one judges. Billy has refrained from judging his event and Tito supervises the scores but doesn’t judge at all. The only other judges that train the pros is Anya Katsevman and Tamara Livolsi and they’re just 2 out of the 15 judges on the finals panel. For this year, most of the top places were professionals that don’t train with the judges. On the Bachata category, none of the winners trains with any of the judges. On the ChaChaCha, the 1st place was for Argentina, which never took a class with any of the judges. Salsa On1 top 3 places, none trains with any of the judges. So, how can there be unfair judging at the WSS? I can assure you all that your “obvious” assumption that the top places at WSS are biased is incorrect. I could be mistaken but I believe that professionals have access to the scores of each judge but due to the hectic nature of this event, this can’t be handed to competitors upon demand, it takes some time. Also keep in mind that scores can not be given until they have been announced. Believe it or not, we are working on having some type of gymnastics-style on the spot digital scoring system but we’ve been working really hard on developing the current scoring system and it’s only one developer working on this, it’s been 2 years and the progress shows but it takes time. The Salsa community is a low-budget market, it develops and improves slowly. That’s good to hear, I would love to see something like that! They don have access. The On2 Australian Couple who didnt make top 10 asked for scores and they were told by Katie that they have to wait till after comp till it goes online. When they asked and insisted on being allowed so they could see where they went wrong in a division that they clearly shoudlve made top 5, they were told no. Its all very clear on video .. chalk and cheese really. All dancers are allowed to to physically see there scores and from what judges at WLDC. I know cause i have asked and i saw my individual judge score sheets. Either way .. all comps have Direct, Indirect, Intentional or Unintentional Bias … thats cause by perception depending on judges likes and dislikes. Might not be malicious bias, but its still there. One would need to agree that these cups are purely based on personal opinion not a a common law/regs for all like in other sports. Nestor, I doubt that it was intentional, not giving the scores from each judge. I suspect that this was a by-result of moving to an all-electronic scoring system. I’ll ask the developer of the system and Billy about this and I’ll reply when I have an answer. It’s very unlikely that this was planned and intentional. Nestor, that’s not always true for the WLDC either. Last year I asked the WLDC head judge (Edwin Rivera) to see the scoresheets, and he told me that I could not see them until after the competition. He promised to post them on Sunday after the competition ended, but two months later, they still haven’t been posted. Nestor, are you sure they should have been top 5? I don’t mean to insult or assume that such Australian couple didn’t deserve to place top 10 however, the On2 division at WSS is the strongest On2 competition in the world. This category was phenomenal from beginning to end. Did u watch the comp? Or ask any of the competitors in that division what they thought … i think you will find your answer there .. Maybe watch the video on youtube and honestly decide on your judgement. Lets say my view is biased but even MANDI on this thread commented earlier and agreed after watching video .. and i dont know who she is so no bias there. The same with Professional Salsa Cabaret division, top 3 places went to professionals that don’t train with the judges. I see your point. It seems like they’re slowly working towards more fairness from the comments here. However, I do think there’s plenty of great world class judges! So many I can think of! People have danced salsa for a long time all over the world and there’re great artists who are just as great as the ones doing it now. So many I can think of in the US and around the world, especially since they claim it to be a global event. I can think of artists in Europe, Asia, Australia, South America, the Carrebean, North America, even Africa! There’s so so many great possibilities. Even in NYC alone I can think of several great and experienced people who have been in the industry for ages, and that’s just NYC. So really there’s no shortage of qualified judges to help avoid potential conflicts of interests. Of course, many artists will probably be familiar with each other, but at least it will be better than folks training and judging the winners. This competition is by far NOT based on personal opinion. A judge thats has ballroom technique will always prefer a dancer with Ballroom technique .. A judge thats street trained will always love dancers that are raw and street trained. Thats not a bad thing, thats common knowledge. Rules are always up for interpretation depending on you dance background and training. Once again, not saying anything was done intentional, but it does happen. If you put any of these dancers in a Dancesport Salsa or Bachata Competition, they would not beat the Dancesport Dancers who train and prepare for those comps..
Would you disagree with this? I totally agree that ballroom dancers are far better than Salsa and Bachata dancers but I don’t see it being relevant here since there is 0% ballroom dancers at WSS; some dancers may have some ballroom training and do some basic usual ballroom steps or moves but that truly doesn’t mean anything when it comes to the final scores. If you read the judging criteria for WSS, there’s really no room for “personal” judging interpretations. 15% Technique: Technique is reflected through balance, placement and line. This refers also to general techinique for partner dance, where the movement is “grounded”, and there is clarity of proper weight changes from foot to foot. Technique and/or body styling that is specific to Salsa Dance. Movement should appear to be both clear and effortless. 15% Difficulty: Reflected by difficulty of patterns, turns, intricacy of shine movements, and level of tricks, dips, drops and flares. Ballroom dancers are not always better than non ballroom! I prefer street dancers in the street world but thats me. As per rules, who determines what right technique is? Or what difficult is? who sets the standard? He who writes the rules and standards will write it according to their opinion. Hence why it varies. Not whats right or wrong … but yes it varies ..
I’m not the type to diverge too much from the original conversation so let me just say that sure, some judges will mark certain criteria higher or lower than other judges but that’s a human thing; nothing anyone can do about that. That’s why the WSS has 15 judges on Saturday night finals… that’s a fair average result IMO. If you got great lines but dance off time then your score sheet will show high dance technique and low timing; that’s how it works. Do you disagree with the judging criteria? I don’t think anyone is disagreeing with the criteria, it’s pretty standard for a salsa competition. But criteria in a dancing competition are never going to be 100% objective– criteria such as musicality, difficulty, originality, and showmanship are all open to interpretation. That’s why it would be nice to see individual scores from each judge, not just one aggregate number. Sure I can agree with that. Now keep in mind that I am absolutely not qualified to make an official statement on behalf of any judge or question anyone’s opinion but I have heard conversations of this nature between the judges and they are well aware that they could be biased without even knowing and they all try really hard to be as objective as possible. This issues seems to arise every year and I think WSS is working to close some of these communication holes. You’ll see more progress on this area moving forward; I think it’s lack of official communication, that’s why I’m taking the time to fill in some missing information in this insightful article. Thanks! Clearly some effort is being made in that direction. Billy Fajardo game me the go-ahead to make a post that competitors of professional categories can submit a request via http://worldsalsasummit.com/about.html to get their detailed score sheets. Keep in mind that this is for PRO divisions ONLY. Earlier I made a comment that Tito Ortos doesn’t judge at all. That is partially correct, in some occasions he may judge or he may just supervise. I’m not clear as to what categories he did judge. I think that all competitions make an effort to do whats best and find ways to make it better. Alejandro Scotti, now i understand where you are coming from, im glad Billy gets to hear about whats going on and is making an effort to share score sheets. Unfortantely it wont change what happened last weekend. In saying that, I find it very rewarding for all dancers around the world to be part of these two competitions…. Pros and Cons will always happen at any comp. Hi everyone my name is Nate Strager. I’m co-director of Sin City Salseros Dance Company who’s been around for 17 years. We’ve traveled all over and seen the mistakes from other congresses so we started the Las Vegas Salsa Bachata Congress years ago to do an event that hopefully didn’t have the same mistakes as other congresses and festivals. Hence I’ve seen the mistakes from other competitions and decided to create my own competition that hopefully will fix these issues. We will only have 10 divisions as I feel there are way too many divisions in the current competitions. The WSS has 70 divisions and the WLDC has 90 divisions. That to me is just too much. Both competitions don’t have a lot of attendance from the public. Most of the attendance in the stands are the competitors. So I created the Ultimate Latin Dance Championship. My view is to reward the dancers by giving away actual prize money in ALL professional categories and you’re being judged by professional dancers. Here’s a brief over view. 1. Our judges are not just Salsa dancers. Our judges are professional dancers that have been in Michael Jackson Smooth Criminal video to Broadway to Cirque Du Soliel to movies and more AND they know Salsa dancing. So I’m not just getting professional dancers that don’t understand Salsa. There will be no biased judging here or who you know. You can check out the judges resumes on your website. 2. After each competitor performs the score will be put up on the screen for everyone to see right away. No waiting until after the competition is over. That to me is shady. Let’s make it public right away so everyone knows. Also the dancers will be able to log into our system and hear the judges remarks as to why they were scored the way they were. 3. Prize money and trophies. We are going to be giving away $16,000 in prize money to 7 professional divisions. That is the most prize money given in any Salsa or Bachata completion in the United States and we only have 7 professional divisions. We will also have 3 amateur divisions but there is only trophies given to them. 4. At the ULDC for instance in the couples division. It doesn’t matter if you dance On1 or On2 or On3 you all will compete against each other. Why have separate disk ions because you break on a different count? Who cares. This is the Ultimate Competition. Other competitions have too many categories which is only geared towards putting registration fees in the promoters pocket and not compensating the dancers. Too many divisions like On1 with mustaches and On1 without mustaches… Lol… We also have a Mega Team division with a fusion of 70% Salsa and 30% any other genre of music for $5,000 first prize. You can use props, sound effects, and more. Let’s compensate the dancers for their hard work. I’m not trying to plug my competition in a bad setting. I’m simply informing the public of the difference between the ULDC and other competitions. Hopefully we’ll be able to fix the wrongs of other competitions and make it right in Vegas. Either way the choice is yours on what’s best for you to compete or attend. Good luck everyone and we hope to see you in Vegas. Looking forward to it, Nate! Sounds like this will be a very cool event! Takeshi, thank you for such a thorough and objective article going down all the main points of comparison between the events. I think for the most part dancers/people in the industry are afraid to speak up and just bear with how things are put together. I’ve never competed in either event nor have I attended either event, but I still very much appreciate the article because it points out the things that can make an event enjoyable (or not) both for the dancers and the audience. I was going to attend the Summit with my wife this year but we decided against it when we found out the cost of the ticket ($150 each). We were interested only in possibly attending Saturday night and we wished they offered an option to do that at a more affordable cost than the $150. I feel the same way about Congresses – in my opinion all Congresses should offer performers the chance to buy a one-night pass or a night performer’s pass rather than forcing them to buy the full event pass. Not everyone can take off from work or wants to spend the money especially if they’re performing only one time during the weekend. I have a little bit different perspective on the presentation (seen mostly from either the live stream or the videos) – a clean, full (all the way down to the ground) subtle color (with any “prettiness” at the top, above or to the sides of the dancers) would actually be best to highlight the dancers/dancing, even if it’s not as pretty. I found the one at the WTC very pretty and looking, but distracting. And the one at the WSS a bit better as far as not being distracting, but because the background had a black horizontal “frame” at the bottom, it interfered with being able to see the whole picture of anyone wearing black pants (mostly the men, obviously.) This was distracting too. Another thing I want to point out is that I wish these events were held at nicer looking hotels, even though I realize this would drive up the costs. In my opinion, a well-organized event catering to high-level dancers should be held at a hotel to match. Doesn’t have to be a 5-star – but something clean and modern and not run down. We attended the Houston Salsa Congress this year and one of our favorite things was that the hotel was actually nice. Also – I don’t understand how it’s possible that an event could promote prize money and then not pay up. Hasn’t anyone ever sued? :/ Or is this a case also of being afraid to speak up. Again, thank you for your honest review, we need more people like you in this industry. The WSS has always paid such advertised cash prizes on the spot.